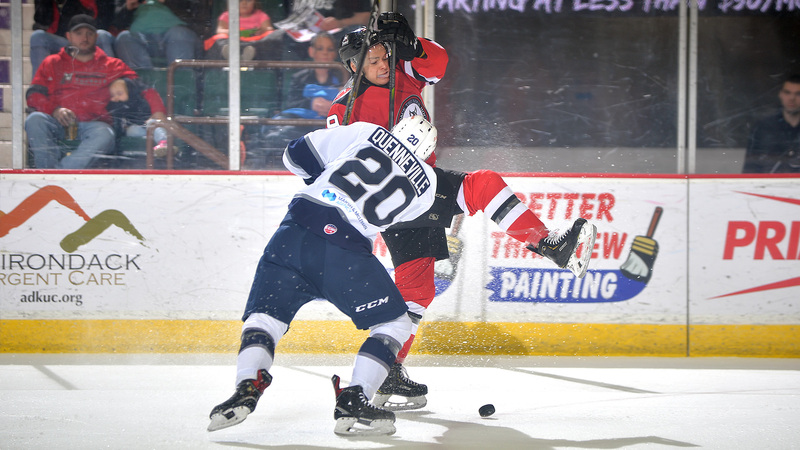 Glens Falls, NY– The Worcester Railers HC (32-29-7-4, 75pts) closed out the 2018-19 regular season schedule with a come-from-behind 5-4 overtime victory over the host Adirondack Thunder (37-26-6-3, 83pts) in front of 3,515 fans at the Cool Insuring Arena on Sunday afternoon. The Railers 2019-20 regular season schedule will be announced later this spring as the club will prepare for their third season of ECHL play at the DCU Center beginning in October 2019. Ivan Chuckarov scored his first two professional goals while Tommy Kelley and Ryan Hitchcock also found the back of the net for Worcester as Mitch Gillam made 32 saves on 36 shots in net for his 21st win of the season. Alex Sakellaropoulos made 19 saves in net for the Thunder while John Edwardh led the way offensively for Adirondack with a pair of goals. Matty Gaudreau netted the game winner at 2:08 of sudden overtime in a back-and-forth game thought saw several lead changes. Nick Sorkin added two assists as the Railers finished with a 15-17-1-3 record away from the DCU Center. Adirondack grabbed a 1-0 lead in the first period on the power play as John Edwardh (26th) ripped a shot through a screen from the left circle that went top shelf at 10:29. The Thunder outshot Worcester 13-7 through 20 minutes as the Railers trailed 1-0 after the first period. Ivan Chukarov (1st and 2nd) scored his first two professional goals in the second period and Tommy Kelley (7th) also scored as Worcester outscored the Thunder 3-1 in the middle frame. John Edwardh (27th) scored a shorthanded goal for Adirondack as the Railers took a 3-2 lead into the second intermission despite getting outshot 26-17 through 40 minutes of play. James Henry (15th) and Matt Salhany (15th) got the Thunder back ahead 4-3 with two quick strikes in the first five minutes of the third period. The Railers would tie the score at 18:40 of the third period as Ryan Hitchcock (17th) fired a rebound into the cage to force overtime. A wild back-and-forth overtime frame saw both teams have several great chances but Matty Gaudreau (12th) carried the puck behind the back of the net and maneuvered his way in front before snapping a quick shot just past Sakellaropoulos’ blocker to give the Railers a 5-4 win at 2:08 of the overtime period. Notes: Three Stars: 3rd star: Matty Gaudreau (OTG) 2nd star: Ivan Chukarov (2-0-2) 1st star: John Edwardh (2-0-2) …. final shots were 36-24 in favor of Adirondack…Alex Sakellaropoulos (19-6-5) made 19 saves on 24 shots Adirondack… Mitch Gillam (21-16-5) made 32 saves on 36 shots for Worcester while Ryan Hubbard served as the emergency backup…. Worcester went 0-for-3 on the power play while Adirondack went 1-for-5…. Kyle McKenzie (inj), Tommy Panico (inj), Alex Vanier (inj), Evan Buitenhuis (inj), Blake Wojtala (inj), Yanick Turcotte (susp), Rob Powers, Bo Brauer, and Matt Schmalz did not dress for Worcester….. Worcester finished 15-17-1-3 on the road this season… Worcester had 49 fighting majors this season – they had 45 last season….Ryan Hitchcock fired four shots on goal….Tyler Barnes finished with a team high 28 goals and 58 points…. Rookie Ryan Hitchcock led the club this season with 32 assists….defenseman Connor Doherty finished the season with a club high +10 rating….Yanick Turcotte led the club with 17 fighting majors and 186 penalty minutes….Ryan MacKinnon, Nick Sorkin (2), Ross Olsson, Josh Holmstrom, Drew Callin, Barry Almeida, Tyler Mueller, and Ryan Hitchcock all added assists for Worcester….The Railers finished 5-7 in overtime this season….Barry Almeida finished with 272 shots on goal – 3rd most in the ECHL. What’s on tap – THANK YOU FANS! Railers send big crowd home happy with 4-3 win over Growlers THANK YOU FANS!